Speakers at a national consultation meeting on Saturday urged the public and private stockholders to work on technology-based sanitation system in cities to achieve SDG-6.2. They also discussed the importance of reviewing and updating policies and strategies on water supply sanitation in light of SDG and different issues on implementation of sanitation programme in urban areas and their sustainability. 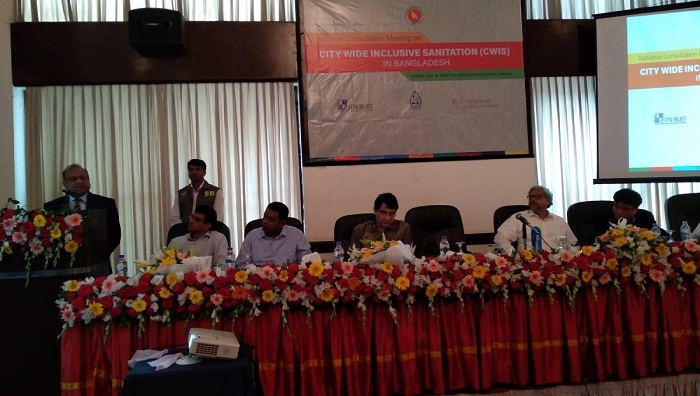 They made the call at a meeting – City Wide Inclusive Sanitation (CWIS) in Bangladesh – at Spectra Convention Centre in the capital. Sustainable Development Goal 6.2 is about achieving access to adequate and equitable sanitation and hygiene for all, and end open defecation, paying special attention to the needs of women and girls and those in vulnerable situations by 2030. Prof Dr Md Mujibur Rahman, FSM sector expert and adviser of ITN-BUET, gave a presentation on sanitation status, FSM and CWIS in Bangladesh. Dr Roshan Raj Shrestha, deputy director of Bill and Melinda Gates Foundation, presented a research paper, and Prof Dr Muhammad Ashraf Ali, director of ITN-BUET, presented summary findings of the workshop on ‘CWIS system for advancing sustainable urban sanitation in Bangladesh’ at Khulna. Department of Public Health Engineering (DPHE) organised the meeting in collaboration with ITN-BUET. It was supported by Bill and Melinda Gates Foundation. LGED Minister Md Tazul Islam said that England has cleaned its Thames River, which was once more polluted than Buriganga. “We can do that as well,” he said. “We don’t have time. We’ve to make commitment to build better sewerage and sanitation system in the cities. We need comprehensive support from national and international organisations for that,” he said. Minister Tazul highlighted the need for inclusion of waste management and water supply system in academic programmes. He said that views exchange programmes, such as this one, will help achieve SDG-6.2. “The government has taken initiatives to achieve Safely Managed Sanitation by 2027 in all municipalities of the country,” he said. Md Saifur Rahman, Chief Engineer of DPHE, said that Bangladesh should modernise the septic tank cleaning system as around 200-300 cleaners die every year in our country. SM Ghulam Farooque, senior secretary of LGRD ministry, said sanitation system is a big challenge to achieve SDG-6. “The government is working to complete master plans for municipalities,” he said.